However, no system available today can completely eliminate injuries and fatalities. Deployment of the air bags temporarily releases a small amount of dust from the air bags. This dust, however, is neither harmful to your health, nor does it indicate a fire in the vehicle. The dust might cause some temporary breathing difficulty for people with asthma or other breathing trouble. To avoid this, you may wish to get out of the vehicle as soon as it is safe to do so. If you have any breathing difficulty but cannot get out of the vehicle after the air bag inflates, then get fresh air by opening a window or door. To reduce the risk of injury when the front air bags inflate, it is very important for the driver and front passenger to always be in a properly seated position and to wear their respective seat belt. For maximum protection in the event of a collision always be in normal seated position with your back against the seat backrest. Fasten your seat belt and make sure it is properly positioned on your body. Since the air bag inflates with considerable speed and force, a proper seating position and correct positioning of the hands on the steering wheel will help to keep you at a safe distance from the air bag. Occupants who are not wearing their seat belt, are not seated properly or are too close to the air bag can be seriously injured or killed by an air bag as it inflates with great force instantaneously: • Sit with the seat belt properly fastened in a position that is as upright as possible with your back against the seat backrest. • Move the driver's seat as far back as possible, still permitting proper operation of vehicle controls. The distance from the center of the driver's chest to the center of the air bag cover on the steering wheel must be at least 10 inches (25 cm) or more. You should be able to accomplish this by adjusting the seat and steering wheel. If you have any difficulties, please contact an authorized Mercedes-Benz Center. • Do not lean your head or chest close to the steering wheel or dashboard. • Keep hands on the outside of the steering wheel rim. Placing hands and arms inside the rim can increase the risk and potential severity of hand/arm injury when the driver front air bag inflates. • Adjust the front passenger seat as far as possible rearward from the dashboard when the seat is occupied. • Occupants, especially children, should never place their bodies or lean their heads in the area of the door where the window curtain air bag inflates. 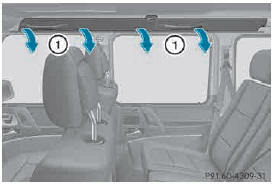 This could result in serious injuries or death should the window curtain air bag be deployed. Always sit as upright as possible, wear the seat belt properly and use an appropriately sized infant restraint, toddler restraint, or booster seat recommended for the size and weight of the child. • Children 12 years old and under must never ride in the front seat, except in a Mercedes- Benz authorized BabySmart™ compatible child seat, which operates with the BabySmart™ air bag deactivation system installed in the vehicle to deactivate the front passenger front air bag when it is installed properly. Otherwise they will be struck by the air bag when it inflates in a crash. If this happens, serious or fatal injury will result. Failure to follow these instructions can result in severe injuries to you or other occupants. If you sell your vehicle, it is important that you make the buyer aware of this safety information. Be sure to give the buyer this Operator's Manual. Accident research shows that the safest place for children in an automobile is in a rear seat. Should you choose to place a child 12 years old or under in the front passenger seat of your vehicle, you must properly use a BabySmartTM child restraint which will turn off the front passenger front air bag. To help avoid the possibility of injury, please follow these guidelines: (1) Always sit as upright as possible, wear the seat belt properly, and for children 12 years old and under, use an appropriately sized infant restraint, toddler restraint, or booster seat recommended for the size and weight of the child. (2) Always wear seat belts properly. The air bags are deployed if the air bag control unit detects the need for deployment. Only in the event of such a situation will the air bags provide their supplemental protection. If the driver and front passenger do not wear their seat belts, it is not possible for the air bags to provide their supplemental protection. In the event of other types of impacts and impacts below air bag deployment thresholds, the air bags will not deploy. The driver and passengers will then be protected to the extent possible by a properly fastened seat belt. A properly fastened seat belt is also needed to provide the best possible protection if the vehicle rolls over. Air bags provide additional protection; they are not, however, a substitute for seat belts. All vehicle occupants must fasten their seat belts regardless of whether your vehicle is equipped with air bags or not. It is important for your safety and that of your passengers to have deployed air bags replaced and to have any malfunctioning air bags repaired. This will help to make sure the air bags continue to perform their protective function for the vehicle occupants in the event of an accident. Observe "Important safety notes" . Your vehicle is equipped with air bag technology which disables the frontpassenger air bag if the system recognizes that the front-passenger seat is empty . indicator lamp is lit up, the front-passenger air bag is disabled. If the front-passenger seat is recognized as empty, the air bag control unit will not deploy the front-passenger air bag in the event of a collision. Ask your passenger to sit correctly on the front-passenger seat in an upright position until the indicator lamp goes out. not go out, please consult an authorized Mercedes- Benz Center. 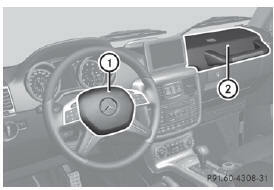 Driver's air bag 1 deploys in front of the steering wheel; front-passenger front air bag 2 deploys in front of and above the glove box. The front air bags increase protection for the driver's and front-passenger's head, neck and chest. If the vehicle rolls over, the front air bags are generally not deployed. If the system detects high vehicle deceleration in a longitudinal direction, the front air bags are deployed. Your vehicle is equipped with a dual-stage driver's air bag and a single-stage frontpassenger front air bag. In the event of a collision, the air bag control unit evaluates the vehicle deceleration. In the first deployment stage, the driver's air bag is filled with enough propellant gas to reduce the risk of injuries. The front-passenger front air bag, however, is immediately filled with the maximum amount of propellant gas. The driver's air bag is fully deployed if a second deployment threshold is exceeded within a few milliseconds. The lighter the front passenger, the higher the vehicle deceleration rate required (predicted at the start of the impact) for triggering the front-passenger front air bag. The front air bags will not deploy in impacts with vehicle deceleration or acceleration rates which do not exceed the system’s preset deployment thresholds for vehicle deceleration or acceleration. You will then be protected by the fastened seat belt. • the front-passenger seat is occupied. The front-passenger air bag is automatically activated and deactivated. Both driver and passenger should always check whether the front-passenger air bag is activated or deactivated. The deployment of the driver's air bag does not mean that the front-passenger air bag will also deploy. If the system recognizes that the front-passenger seat is empty, the frontpassenger air bag does not deploy even if the impact fulfills the criteria and the driver's air bag has deployed. • you turn the SmartKey to position 1 or 2 in the ignition lock. • the engine is running and then you switch it off. This indicates the operational readiness of the front-passenger air bag. indicator lamp does not light up, the front-passenger front air bag is enabled and can be deployed. Window curtain air bags 1 enhance the level of protection for the head, but not chest or arms, of the vehicle occupants on the side of the vehicle on which the impact occurs. Window curtain air bags 1 are integrated into the side of the roof frame and deploy in the area extending from the front door (Apillar) to the rear door (C-pillar). • independently of seat belt use • if the vehicle rolls over and the system determines that window curtain air bag deployment can offer additional protection to that provided by the seat belt • independently of the front air bags Window curtain air bags will not deploy in impacts which do not exceed the system's preset deployment thresholds for lateral acceleration/deceleration. You will then be protected by the fastened seat belt.